Because of the many registrations, we’ve decided that this years student performance will be held at De Pekhoeve in Ulvenhout. 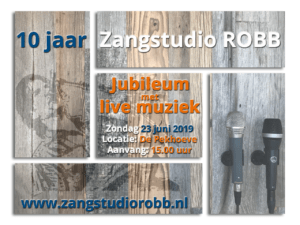 On that day we’ll also celebrate the 10th anniversary of Vocal studio ROBB. Approximately 16 acts will perform that afternoon. Like every year, this afternoon will be fun!. Doors are open at 14.30 hrs, the first act will begin at 15 hrs.